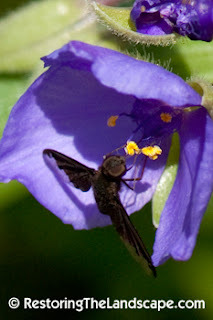 Ohio Spiderwort flowers open in the mornings for insect visitors, then close up during the heat of the day. The attractive blue to purple flowers have a fuzzy appearance due to the fine hairs on the filaments. 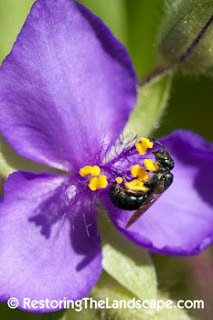 Spiderwort flowers from late April through to July. 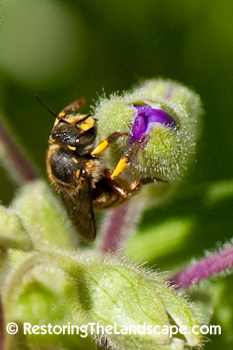 Bees are the primary visitor, for the abundant pollen in particular. Bumble Bees such as Bombus bimaculatus pictured here collect pollen to provision their nests. Another common spring occurring bee is the Mason Bee (Osmia sp. ), their hairy, blue metallic bodies make them fairly easy to identify. Mason Bees build nests in cavities, they are the primary nester in bee boards in our area. 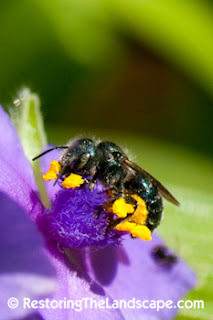 Small Carpenter Bees (Ceratina sp.) 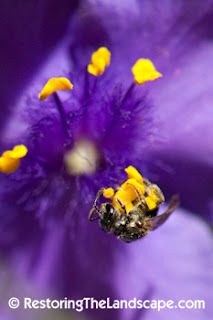 feed on the pollen of Ohio Spiderwort. They nest in hollow or pithy stems. A great reason to leave dead, pithy branches such as Elderberry in your landscape to provide nesting habitat for this small bee. Small Sweat Bees (Lasioglossum sp.) also like the pollen of Ohio Spiderwort. We have a lot of Small Sweat Bees in our landscape, probably because our soils are sandy which is where this ground nesting bee likes to excavate its nests. 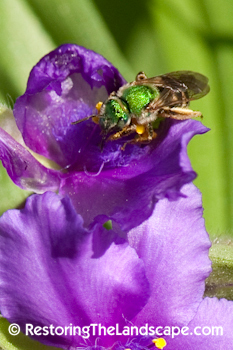 Larger Sweat Bees such as this Green Sweat Bee (Agapostemon sp.) are brightly colored and hard to miss. They also nest in the ground. These are one of the more difficult bee species to photograph, they're fast-moving and not as willing to stay in one place for very long. 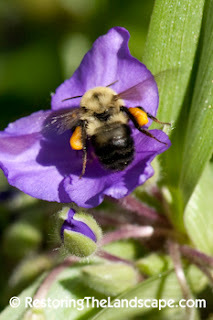 The one type of bee that doesn't visit Ohio Spiderwort flowers for pollen is the European Wool Carder Bee (Anthidium manicatum). An introduced species from Europe, females like to visit Ohio Spiderwort for the fine hairs on the buds and flower stalks. Females chew the hairs with their sharp mouthparts, and use the 'wool' to make brood cells. 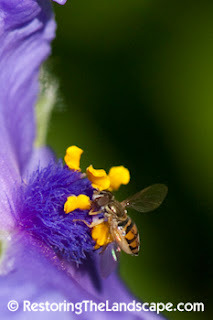 Syrphid Flies of many types will visit flowers and feed on pollen. Also look for Bee Flies investigating the flowers. And where there are bees, there are predators about such as this crab spider, legs outstretched waiting for the unsuspecting bee to stop by. 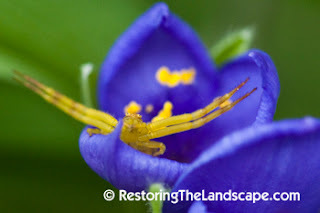 Ohio Spiderwort is a very adaptable prairie native of medium to dry soils, in full to part sun. It's a great early spring source of pollen for our native pollinators.